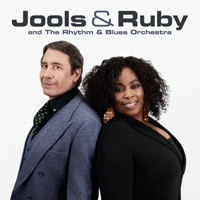 Jools & Ruby is a unique collection of collaborations between the boogie-woogie master Jools Holland and the UK’s queen of soul Ruby Turner.Featuring a selection of the duo’s personal favourites and crowd-pleasers, including four new recordings, Jools & Ruby has been released on East West. The album features a number of new recordings including Peace In The Valley and Same Old Heart plus brand new compositions Pray Have Mercy, co-written by Jools & Ruby, and Christmas Song with the music written by Jools to accompany the poem by Wendy Cope. Additional tracks include airwaves favourites The Informer, Jumpin’ In The Morning, and This Train. Jools Holland and Ruby Turner first met 22 years ago when Jools was looking for singers to join his big band. Ruby’s incredible voice matched her big personality and the two soon became dear friends. Describing Ruby as the sister he never had, Jools even invited the singer to perform at his wedding. The duo have gone on to write and record music together and travelled the world with tours alongside the much-loved Rhythm & Blues Orchestra (currently on their thirty-four date Autumn/Winter Tour across the UK and Ireland). After two wonderful nights at London’s Royal Albert Hall, Jools Holland and Ruby Turner closed The Andrew Marr Show on Sunday morning with a touching stripped down version of Same Old Heart, a new song they have co-written for their brand new album Jools & Ruby, out on Friday 4th December. Jools, on piano, and Ruby, on vocals, were accompanied by Louise Marshall and Mabel Ray on backing vocals and Gilson Lavis on drums. In case you missed it, the performance is on iPlayer till the End of December. Other illustrious guests on the show were Labour leader Jeremy Corbyn, defence secretary Michael Fallon and deputy leader of the Scottish National Party, Stewart Hosie.